South Korean yarn giant Hyosung has developed a new four-way stretch fibre technology for use in denim, which has been prompted by consumer demand for a 'second skin' fit. 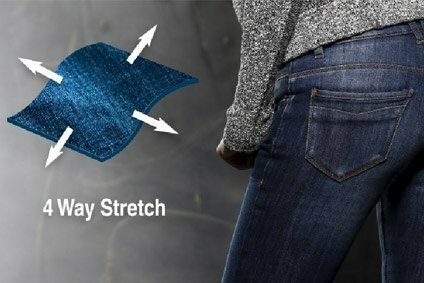 The Creora Fit² technology, which will launch at the Denim by PV trade fair in Barcelona from 18-19 November, offers reduced shrinkage and better recovery, the company claims. “Looking forward to 2017, we see continued demand for super stretch denim for women and men. Today’s consumers expect denim to fit better and with more comfort,” says Ria Stern, global marketing director at Hyosung. The company has partnered with denim mill, Soorty of Pakistan, to introduce a new collection called Zumba using Creora Fit² to capitalise on the athleisure trend. “Creora Fit² technology has allowed us to create a new collection of four-way stretch denim with higher stretch but without the typical warp shrinkage and instability issues,” says Levent Korkmzer, head of R&D at Soorty. A fully integrated vertical textile manufacturer, Soorty has a monthly production capacity of more than 5.5m metres in its fabric division and 2.4m pieces for its garment unit in Pakistan. It also operates a garment factory in Bangladesh with a capacity of 1m pieces per month.